Well that was rather repetitive. Can't say I get much out of it because it's over pretty quickly, but the production is typically fine at least. It certainly does exist, that's for sure. A pretty funky sound for Peking Duk. A lot less dancey than their previous songs. Not bad at all. I couldn't stand either of their big 2014 hits and their other singles barely fared any better but I like this one. https://imgur.com/FiZ41X7<;br><br>I still am surprised by how much I ended up enjoying this. 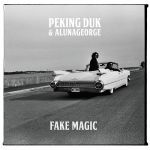 Definitely Peking Duk's best since "Take Me Over". In a way though it sounds catered to me. A funky beat and the inclusion of AlunaGeorge were sure to lure me in. I like that it diverts a bit from their usual formula because it worked really well. No big drop but still great to pump up the volume too as well as great to sing badly too :P Hella catchy and gives me lots of good vibes.